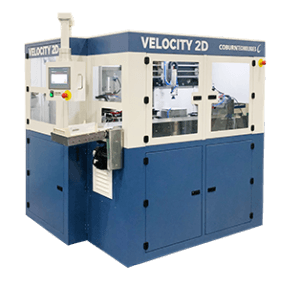 Velocity 2D is the next generation of the current Velocity Automated Spin Coater, now designed with dual-coating technology. Derived from the existing platform of the ground-breaking Velocity Automated Lens Coater, the Velocity 2D now offers labs the ability to coat lenses with two different coating solutions in one machine. It can be paired with Coburn’s Duality Lens De-Taper and Cleaner to offer labs smart, scalable automation for lens processing, as lenses are detaped, cleaned, and coated in one smooth process.